Spring Willys Reunions, 2002-2018 -- photos from the annual Midwest event. Willys Parade to the Chrysler Museum -- during the 2007 Reunion. Caravan to Cuyahoga -- cruising at the 2013 Reunion. Willys Jeep Rally, 2016 -- a weekend of working Jeeps at Hueston Woods, Ohio. Omix-ADA Jeep Heritage Expo 2016 -- the Jeep Collection on display in Georgia. Southeast Willys 2017 -- CJ-3B wins trophy at North Carolina get-together. Great Willys Picnic 2012 -- held in June in Pennsylvania. Great Willys Picnic 2014 -- 15th annual edition. Great Willys Picnic 2016 -- CJ3B.info visits the Picnic and takes a train ride. Toledo Jeep Fest 2016 -- Surreys, Fire Jeeps and more. Northern Ohio Flatfender Cruise-In -- annual Willys party since 2010. 3B's Making Splash at Car Shows -- local shows around the U.S.
Yipao Festival in Calarcá -- parade in Colombia, 2008. Yipao: The Willys Festivals of Colombia -- 1996 photos from Armenia. 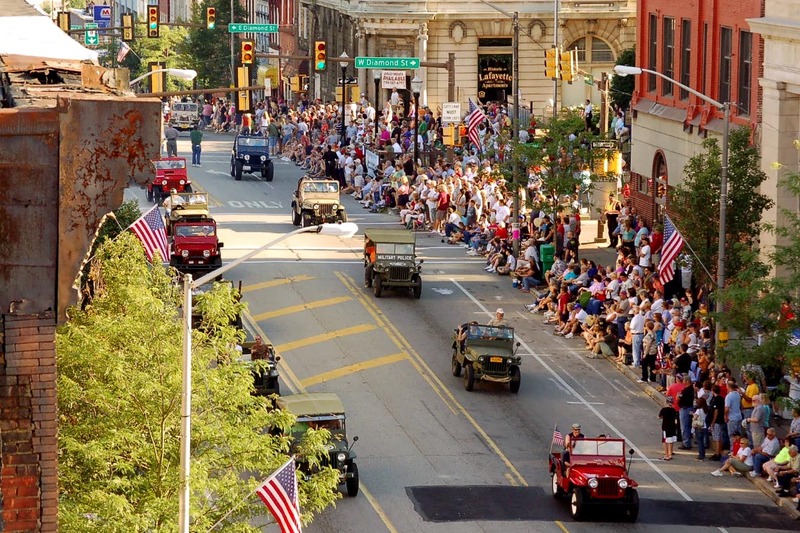 World Record Jeep Parade, 2006 -- event in Colombia inspires Bantam Fest parade. Bantam Jeep Heritage Festival, 2011 -- breaking the record. Bantam Jeep Heritage Festival, 2016 -- CJ3B.info hits the trails and the Jeep Invasion. North to Alaska -- Joe Beadenkopf's '53 in the "Alaska or Rust" caravan. 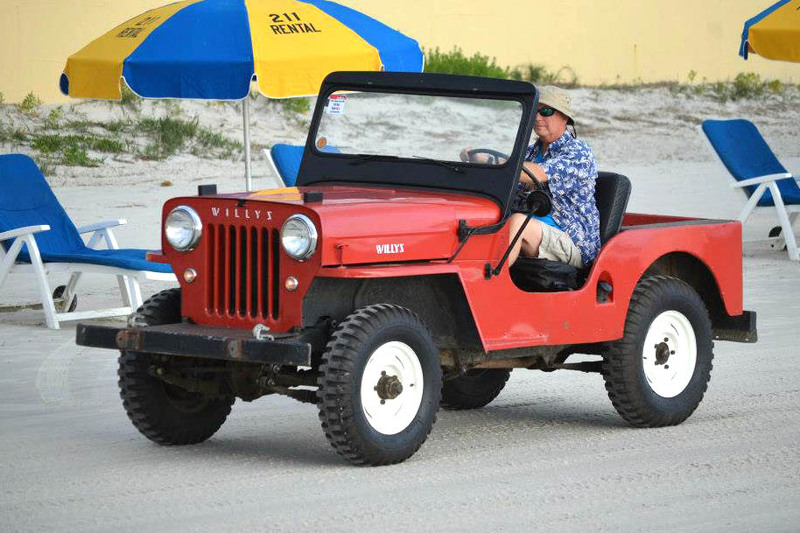 Willys Crashes Party at Jeep Beach -- 3B visits huge Daytona Beach show. CJ-3Bs Lined Up -- photos from the PNW Jamboree in WA and the Willys Run in MA. 1958 CJ-3B at the Jeep Shows -- Peirce Eichelberger in Pennsylvania. Warn Willys at SEMA -- one of the "15 Hottest Classics" at the 2014 show. SEMA 2009: Debut of the ICON CJ3B -- the hi-tech replica vehicle. Jeep-Heep-Heep -- meet in Switzerland packed with 3B's. Mint '63 Wins Best in Class -- Rhinebeck Auto Show 2005 in NY. All Breeds Jeep Show, 2005 -- nice built 3B and a nice stocker. See also Larry Shank's CJ-3B at a Vintage Trailer Rally.